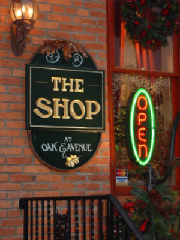 Welcome to The Shop at Oak & Avenue's website. We're not into diamonds, platinum or gold ... but one trip to The Shop and you'll be sold! First time visitors and returning customers alike are delighted by the wide variety of unique gifts and jewelry that await them at "The Shop". Whether you're looking for jewelry to match an outfit, a handbag for a special occasion, or gifts for family and friends ... this is the place for you! Custom jewelry designs are made on site by local resident and proprietress, Melanie Mizak Williams, whose specialties have included designs for proms, weddings, anniversaries and birthdays. We have treasures to fit every budget including hand-blown glass balls, photo frames, keepsake boxes, baby gift items, soy candles, and seasonal wreaths. Our personalized service and friendly atmosphere will help to make your browsing experience an enjoyable one. We accept major credit cards, debit cards and personal checks. Gift certificates and layaways are also available. And remember ... your purchase will always be beautifully gift wrapped at no extra charge. We are located at the intersection of Oak Street and Route 61 (the Avenue) in Mount Carmel, PA. The historic brick building dates back to the late 1800's, when it served as the borough's first City Hall and Jail. In the early 1960's, the building housed Mt. Carmel's first Public Library. Hours: Thursday 12 p.m. - 5 p.m., Friday 12 p.m. - 5 p.m., Saturday 12 p.m. -5 p.m.
To place a custom order or to schedule an appointment, please call and leave a message, or contact me by email at: webwoman@lycos.com. Please take a few moments to browse our on-line photo gallery by clicking on the link below. Although many items are sold or one-of-a-kind, the photos will give you an idea of the quality of my work. I do my best to accommodate special requests. If you see something you like, simply drop me an email and we can discuss. Thanks for visiting!